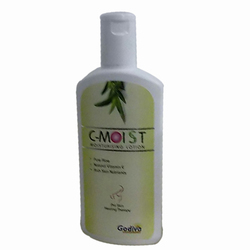 Moisturizing lotion prepared with combination of Aloe Vera and milk protein. Aloe Vera penetrates into the skin due to its excellent penetrating properties. Aloe Vera is used for enhancing beauty as long as we know. Aloe Vera is very useful in treating a lot of skin problems. Aloe vera moisturizing lotion is widely recommended by clients owing to its perfect humectant and moisturizing properties. Processed using best quality herbal ingredients, this lotion make skin soft, smooth and elastic and also provide soft and silky feel. Being a client centric organization, we are involved in manufacturing and supplying a wide range of Aloe Vera Moisturizing Lotion for Cosmeceutical Industries. These are widely used by clients for face, hands, body and other parts to reduce the effective of environment and pollution. Enriched with Aloe Vera, Cucumber, Carrot, Walnut, Almond oil and Olive oil.